Disney’s Riviera Resort reservations are now open for stays beginning December 2019. The newest Disney Vacation Club Resort and 15th in the lineup brings French and Italian influence to guests. The Riviera Resort reflects the travels of Walt and Lilian Disney through Europe. It’s expected to bring those little touches to each of the 300 villas offered. 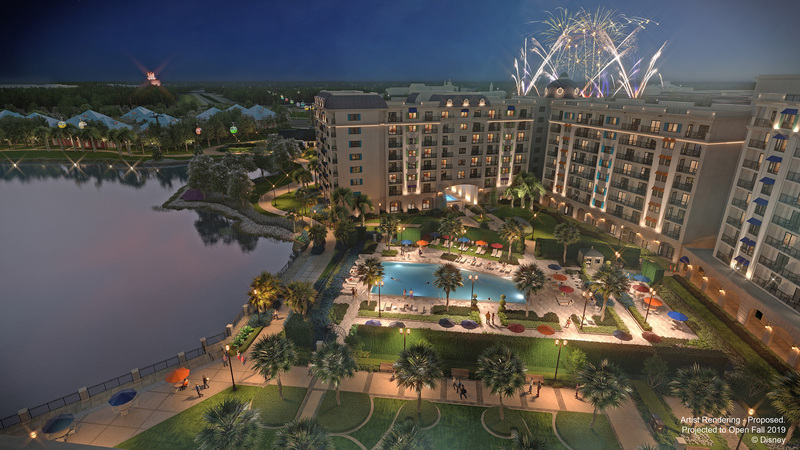 This resort will open in time for the beginning of Walt Disney World‘s largest expansion ever. Star Wars: Galaxy’s Edge opens near the end of the year and guests will have direct access thanks to the Skyliner Station. Along with the architecture, culinary influence is another important part of the resort. Topolino’s Terrace – Flavors of the Riviera is the new, signature table-service restaurant perched on the rooftop of Disney’s Riviera Resort. Topolino is the Italian name for Mickey Mouse so it’s a fitting name for the restaurant. The rooftop location of Topolino’s Terrace offers views of the nighttime spectaculars at nearby Epcot and Disney’s Hollywood Studios. Inside Topolino’s Terrace, guests can watch with wonder as their meal is prepared just for them at the exclusive expo kitchen or wood-burning grill. Guests looking to pair their meal with a glass of wine can choose from an impressive collection of wines sourced from the Mediterranean coast. Throughout the restaurant, a stunning visual aesthetic is created through modern interpretations of textures, colors, carved details, and stonework found in ancient villages along the Riviera. Plus, families looking to start their morning off with a breakfast experience can visit Topolino’s Terrace for exclusive Disney character dining inspired by the Riviera. There are of course a few more places to grab a bite to eat inside the resort. Le Petit Café is located in the lobby of the resort and offers fresh coffee during the day and a wine selection at night. Primo Piatto is the quick-service location inside Disney’s Riviera Resort. We’re uncertain what the menu may look like but Italian dishes along with guest favorites are likely. That leaves Bar Riva, located next to the poolside. There, guests can enjoy beverages while relaxing with a seaside vibe. Guests traveling to Epcot or on to Disney’s Hollywood Studios can do so via the Disney Skyliner. Along with the theme parks, guests have quick access to the neighboring resorts. Disney’s Art of Animation Resort, Disney’s Pop Century Resort and Disney’s Caribbean Beach Resort. Guests traveling to other destinations on Walt Disney World property will do so via bus. Guests will not be able to walk to any other destinations. That’s a quick overview of what’s new for Disney’s Riviera Resort and the most exciting part is the fact you can book it now. Visit the resort website for more information or call 407-W-Disney to make a reservation.